↑ अ आ इ ई Clements, William M. (2006). The Greenwood Encyclopedia of World Folklore and Folklife: Southeast Asia and India, Central and East Asia, Middle East. 2. Greenwood Press. पपृ॰ 106–110. आई॰ऍस॰बी॰ऍन॰ 0-313-32849-8. अभिगमन तिथि 2011-10-16. ↑ Penjor, Ugyen (2003-01-19). "From Ngesem Ngesem to Khu Khu Khu... Rigsar Music Woos Local Music Fans". Kuensel online. अभिगमन तिथि 2011-10-30. ↑ "Rigsar Dranyen". RAOnline. 2011-06-17. अभिगमन तिथि 2011-10-30. ↑ अ आ इ Kinga, Sonam (2003). "The Attributes and Values of Folk and Popular Songs" (PDF). Journal of Bhutan Studies. 3 (1): 132–170. अभिगमन तिथि 2011-10-30. ↑ Pearlman, Ellen (2002). Tibetan Sacred Dance: a Journey into the Religious and Folk Traditions. Inner Traditions / Bear & Co. आई॰ऍस॰बी॰ऍन॰ 0-89281-918-9. अभिगमन तिथि 2011-10-16. ↑ "Sounds of the Thunder Dragon". The Rhythm Divide. 2005-05-11. अभिगमन तिथि 2011-10-16. ↑ Rennie, Frank; Mason, Robin (2008). "12: The Metaphorical World of Archery, Karma Pedey". Bhutan: Ways of Knowing. IAP. पपृ॰ 95–103. आई॰ऍस॰बी॰ऍन॰ 1-59311-735-3. अभिगमन तिथि 2011-09-25. ↑ "Department: Culture: Divisions". Nangsi Lhenkhag – Ministry of Home & Cultural Affairs Online. Government of Bhutan. अभिगमन तिथि 2011-10-15. ↑ Ardussi, John; Pommaret, Françoise (2007). 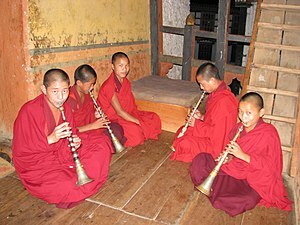 Bhutan: Traditions and Changes. Brill's Tibetan Studies Library. BRILL. पृ॰ 3. आई॰ऍस॰बी॰ऍन॰ 90-04-15551-1. अभिगमन तिथि 2011-10-15. ↑ Leiter, Samuel L. (2007). Encyclopedia of Asian Theatre: A-N. Encyclopedia of Asian Theatre. 1. Greenwood Press. पृ॰ 61. आई॰ऍस॰बी॰ऍन॰ 0-313-33530-3. अभिगमन तिथि 2011-10-15.